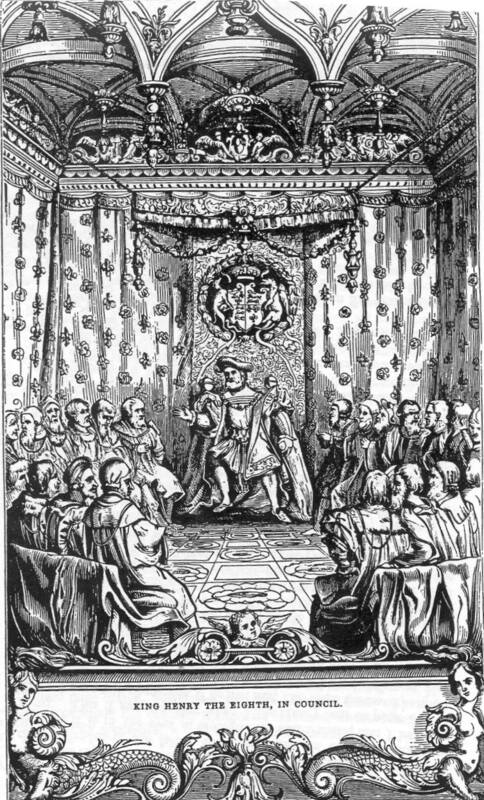 King Henry`s Oration to the people 8 November 1528. Our trusty and well-beloved subjectsboth you of the nobility, and you of the meaner sort: It is not unknown to you, how that we, both by God’s provision, and true and lawful inheritance, have reigned over this realm of England almost the term of twenty years; during which time, we have so ordered us (thanked be God !) that no outward enemy hath oppressed you, nor taken any thing from us, nor we have invaded no realm, but we have had victory and honour, so that we think that you nor none of your predecessors ever lived more quietly, more wealthily, nor in more estimation, under any of our noble progenitors. But when we remember our mortality, and that we must die, then we think that all our doings in our lifetime are clearly defaced, and worthy of no memory, if we leave you In troubles at the time of our death; for if our true heir be not known at the time of our death, see what mischief and trouble shall succeed to you and to your children. The experience thereof some of you have seen after the death of our noble grandfather, king Edward the Fourth; and some have heard what mischief and manslaughter continued in this realm between the houses of York and Lancaster, by the which dissension this realm was like to have been clearly destroyed. And although it hath pleased Almighty God to send us a fair daughter, of a noble woman and of me begotten, to our great comfort and joy yet it hath been told us by divers great clerks, that neither she is our lawful daughter, nor her mother our lawful wife, but that we live together abomlnably and detestably in open adultery; insomuch that when our ambassade was last in France, and motion was made that the duke of Orleans should marry our said daughter, one of the chief counsellors to the French king said, It were well done, to know whether she he the king of Engand’s lawful daughter or not; for well known it is, that he begot her on his brother’s wife, which Is directly against God’s law end his precept. Think you, my lords, that these words touch not my body and soul? Think you that these doings do not daily and hourly trouble my conscience, and vex my spirit.? Yes, we doubt not, and if it were your cause every man would seek remedy, when the peril of your soul, and the loss of your inheritance is openly laid to you. For this only cause I protest before God, and on the word of a prince, I have asked counsel of the greatest clerks In Christendom; and for this cause I have sent for this legate, as a man indifferent, only to know the truth, and so to settle my conscience, and for none other cause, as God can judge. And as touching the queen, if it be adjudged by the law of God that she is my lawful wife, there was never thing more pleasant nor more acceptable to me in my life, both for the discharge and clearing of my conscience, and also for the good qualities and conditions which I know to be in her. For I assure you all, that beside her noble parentage of the which she is descended (as you well know), she is a woman of most gentleness, of most humility and buxomness, yea, and in all good qualities appertaining to nobility she is without comparison, as I, these twenty years almost, have had the true experiment; so that if I were to marry dgain, If the marriage might he good, I would surely choose her above all other women. But ifit be determined by judgment, that our marriage was against God’s law, and clearly void, then I shall not only sorrow the departing from so good a lady and loving companion, but much more lament and bewail my unfortunate chance, that I have so long lived in adultery, to God’s great displeasure, and have no true heir of my body to inherit this realm. These be the sores that vex my mind, these be the pangs that trouble my conscience, and for these griefs I seek a remedy. Therefore I require of you all, as our trust and confidence is in you, to declare to our subjects our mind and intent, according to our true meaning; and desire them to pray with us that the very truth may be known, for the discharge of our conscience God saving of our soul: and for the declaration hereof I have assembled you together, and now you may depart.